Hello! how is everyone doing today? did you enjoy your Silver week?! what did you do? anything fun or exciting? if you have photos please show me! I am always very interested in seeing vacation photos. As for myself, I celebrated my best friend's birthday. We went to a Mexican restaurant in Shinsaibashi called "El Pancho". If you like Mexican food I really recommend it! This week was very short! only two days of school so I don't have much to write about this week. Next week I'll try and write longer. Thanks for reading and have a great weekend! Hello! how is everyone doing today? Next month will be October! wow! I can't believe it! 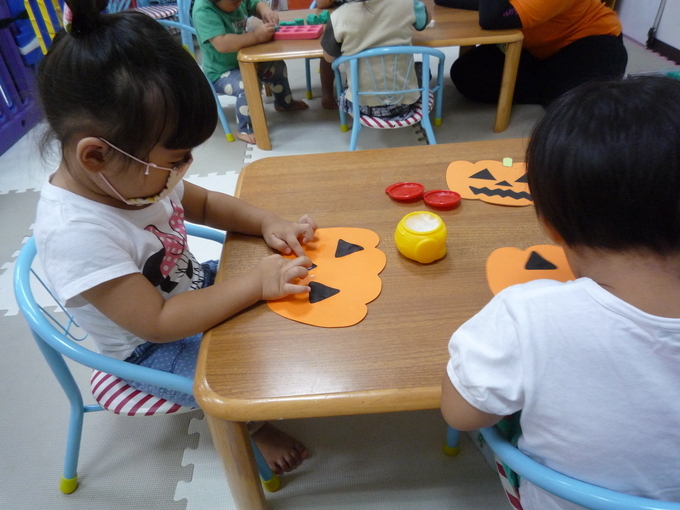 preschool, international school and after school and saturday school have all been practicing very hard for the events we have planned for our annual Halloween party. The students are practicing dances, songs and even memorizing speeches. I can't wait until we get to perform them for you. Preschool has been very busy. 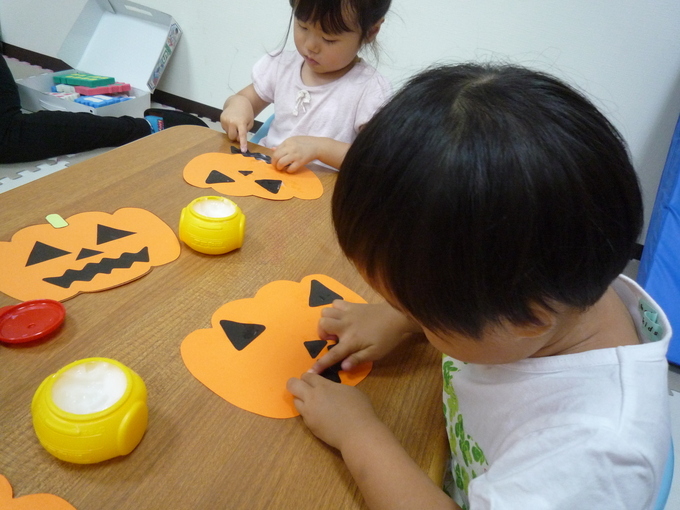 We are almost finished our spooky Jack O'lantern craft. You may see some of them displayed in the classroom. We are also reading very cute Halloween stories for book/phonics time. 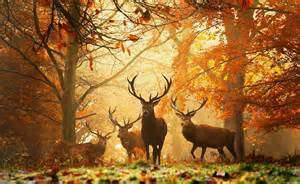 Thank you for reading and as always have a great weekend! don't forget that schools are closed until September 24th. There will also be no after school classes. Thanks and enjoy your holidays! Hey, everyone! I hope you`re is doing well. Yesterday, we here at KSIS got to play with clay. This was the first time we had got a chance to use clay in many months, so everyone was eager to do it again. Cakes, noodles, snakes, witches, alphabet letters, octopus balls. These are only a few of the various things everyone made! As you can see, everyone had a lot of fun! Hello! How is everyone doing today? I am so happy that the weather is finally getting a little cooler!!! To celebrate the cool weather, last weekend I went to Starbucks and tried their new Chestnut flavored frappuccino!!! It was very delicious! I really recommend it. They also have a chestnut latte if you want something to drink thats warmer. In America, we don't really eat chestnuts. In the fall, we usually have pumpkin flavored sweets and coffees. However, American pumpkin is very different from Japanese pumpkin. We almost never eat the pumpkin itself but rather we eat the seeds and roast them in the oven with cinnamon or other spices. Also, the taste is more sweet. In America, pumpkins are more of a sweet and not a vegetable. There are many American jokes about people knowing when fall is coming because they can see the girls drinking pumpkin spice lattes and wearing UGG boots. I hope everyone enjoys their weekend! 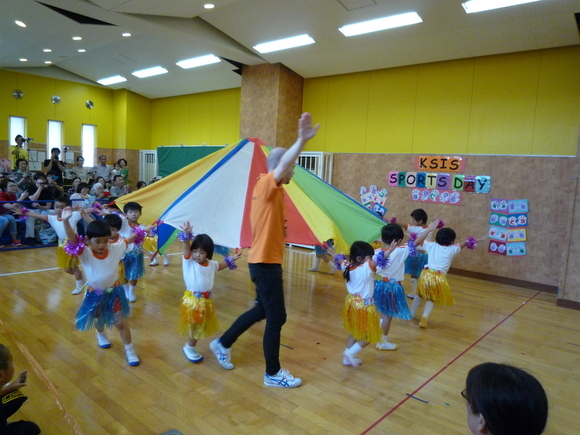 Kids Smile Sports Day is on Sunday so please enjoy the performances! Hello! How is everyone this week? 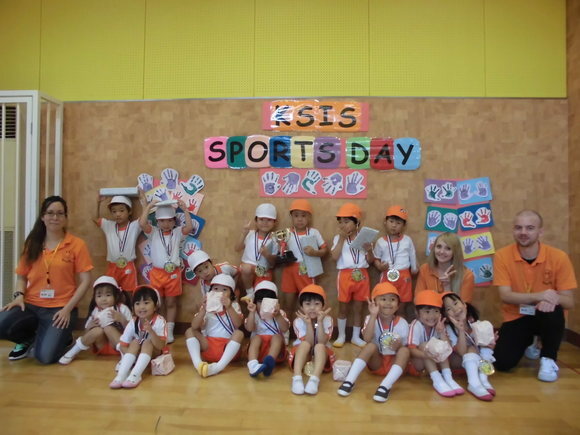 As everyone knows this Sunday will be Kids Smile`s second annual sports day. We have a lot of sports lined up for the day, and over the past couple weeks, we`ve been practicing them here at school. For myself, I`m really looking forward to two particular games: the pajama race (seeing the kids run with their parents) and tug of war (because I get to participate too!). We also have the dance and paraballoon performances, which I think everyone will enjoy. 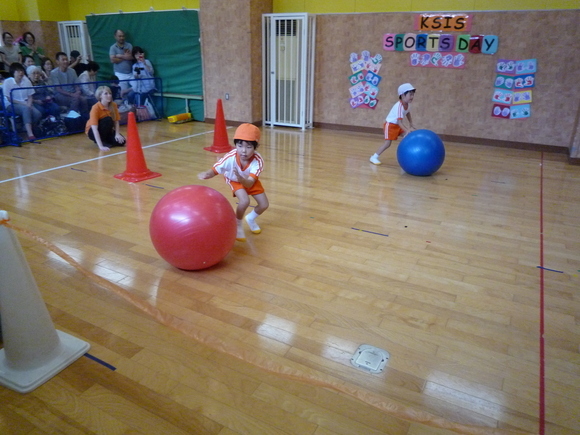 I believe everyone is going to have a lot of fun on sports day! I hope everyone enjoys it as much as we have preparing for it! 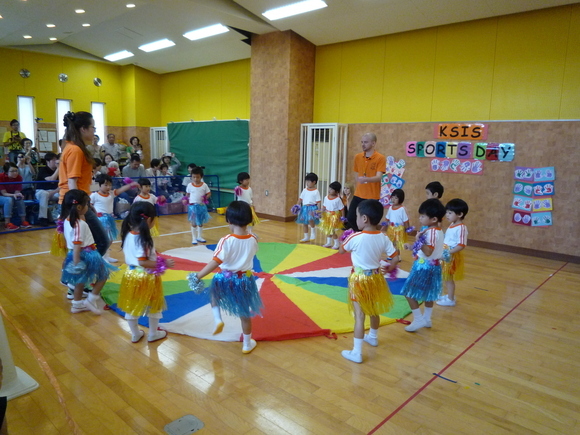 Every Monday at KSIS, we have PE class with Shibu Teacher. All of the children look forward to this weekly lesson and get very excited when Shibu Teacher arrives at the school with all of his equiptment. 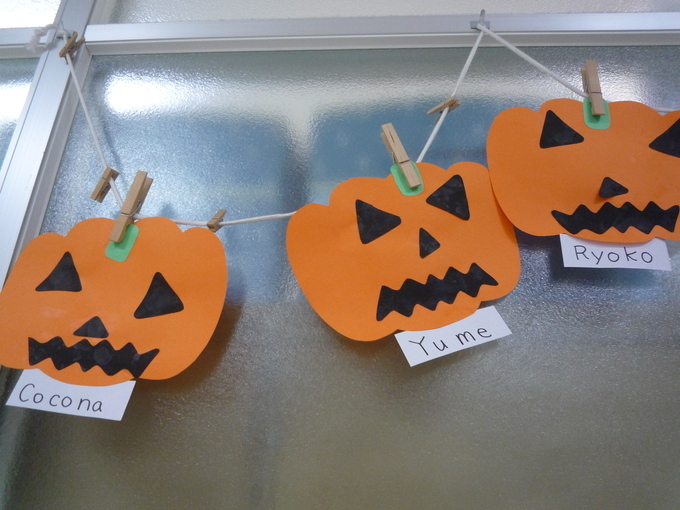 Each week the children focus on different activities and are also practicing for the presentation in Novemeber. One of the main things the children practiced this week was jumping over the vault. Rose class are already able to jump up very high all by themselves, but still need to focus on landing straight. Some of the students can jump over the vault all by themselves, and others need a little bit of help. Each class had their own turn in trying and by the end of the class, all the students were able to do it very well. I`m looking forward to seeing what they will do next week!